John Russo was the co-writer of George Romero's original Night of the Living Dead, and in the early 1980s Russo was determined not to let you forget that. 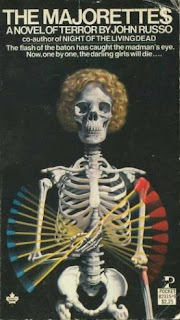 Somehow, these slim and silvery paperback originals from Pocket Books never brought him the same respect and acclaim that Romero had in the genre. Go figure. 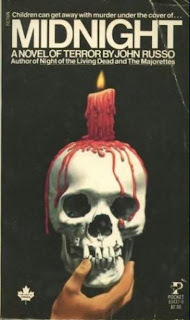 At least the cover art was a great snapshot of '80s horror fiction: skulls with hair, skulls with candles, malevolent felines, and grasping hands. And a grasping feline hand, of course. 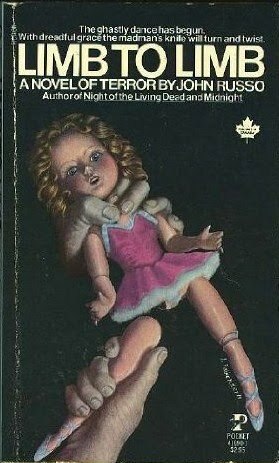 The Majorettes (1979) was a staple title on the shelves in the used bookstore I worked at, and I'm pretty sure Midnight (1980) made its rounds as well. 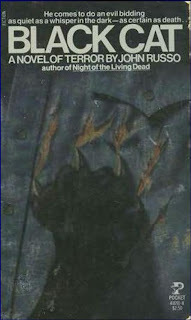 I paid about $10 for that Night of the Living Dead novelization from '81 but haven't gotten around to reading it. I've got the movie memorized, why bother? I like the generic font of the titles: stark and simplistic, a promise, a threat... although Limb to Limb (1981) makes no sense; I believe the phrase is "limb from limb," no? All great covers for sure. But you missed his best one; DAYCARE. Russo's Inhuman was a crappy book with a great cover (at least the version with the lizard-faced person). I've never heard of Black Cat. Interestingly enough, when I first read The Majorettes, Midnight and Night of the Living Dead they were sold with the covers torn off (I didn't realize this was a bad thing back then) so I never really knew the cover art. I've got three of Russo's novels. 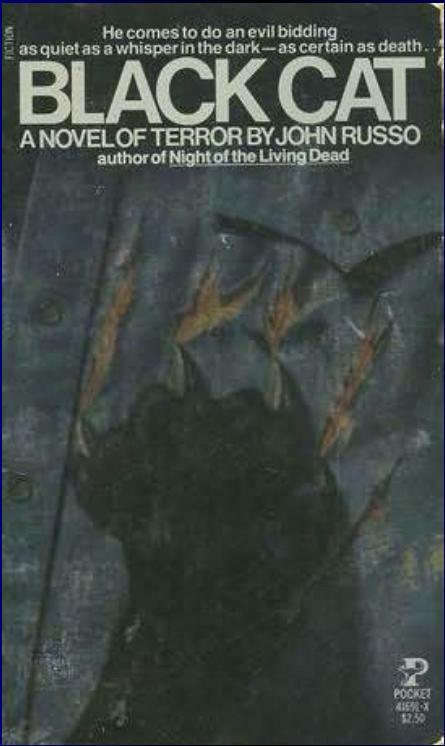 The first printing of both his novelization of NOTLD & his sequel RETURN OF THE LIVING DEAD. Plus BLACK CAT. Only read the latter two. Rather wish I hadn't wasted my time. 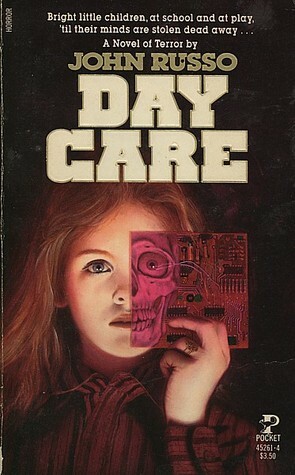 Man, you hit the nail on the head - I remember wiling away the hours as a child pondering the painted skull covers of books like these while my mom shopped for antiques (being too young to really read them, they seemed extra fraught with meaning and resonance) Good times, thanks for all your invaluable archiving of this lost art. I have a love/hate with Russo. I think his 'Majorettes' (book and movie), Limb to Limb (shocking grammar!) and 'Black Cat' are awful. I like 'Midnight'. I don't mind the film, either, altho sections are so amateurish; others are sleazy and wonderfully vile. For mine, his best book is 'The Awakening', a fairly original vampire tale. Also not bad are 'Inhuman' and 'Day Care'. Thanks guys, glad you liked 'em... Hey Craig, you can see I added DAYCARE! Ahhh yeah, that's the stuff. Thx, Will. You made the right decision about the NOTLD novelization; aside from about three paragraphs at the beginning, it's a straight transcription of the screenplay put into past tense with "he said/she said" added. The film version of The Majorettes is fun if you like stereotypical 1980s cheese cinema. The theme song/dance routine is worth watching for the laughs...and the memories. Russo wrote and edited a great book on making independent movies back in the late 80s/early 90s. Of course, nothing in that book applies to independent film production today, but it's an entertaining read with contributions from Tom Savini, Oliver Stone and others. 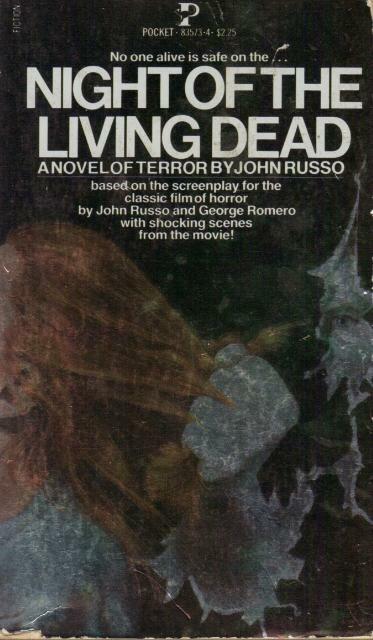 Have you read Russo's sequel to Night of the Living Dead? I just finished it and was wondering what you thought of it.